There were dueling trends in the thermal coal industry in November, here’s why some miners did well and one fell flat. In November thermal coal miner Cloud Peak Energy (NYSE:CLD) fell roughly 13%. However, coal-focused Natural Resource Partners (NYSE:NRP) rose around 16% and Westmoreland Coal (NASDAQ:WLB) lept nearly 66%. That's pretty disparate performance for a trio of coal miners with heavy exposure to the coal used in power plants. The devil here is in the details. For example, of this trio, Natural Resource Partners is the most diversified. Natural Resource Partners' coal operations span Northern Appalachia, the Illinois Basin, and the Powder River Basin. Through the first nine months of the year, the Powder River Basin was the smallest revenue contributor, accounting for a little under 12% of the partnership's coal royalties and just 5% of the partnership's overall royalty income. That last stat gives a hint at the diversity within Natural Resource Partners and sets it apart from Cloud Peak which gets virtually all of its revenues from the Powder River region. Natural Resource's portfolio included thermal coal, metallurgical coal, oil and gas royalty interests, and other mineral interests like sand and gravel. While coal is, indeed, the biggest part of the business (roughly 45% of the top line through the third quarter), its interests are far more varied than either Cloud Peak or Westmoreland, which is focused on mine-mouth coal mines (more on that in a second). Natural Resource Partners benefited from rising thermal and metallurgical coal prices, which it outlined when it reported decent earnings the day before the U.S. election. But also from its aggregates business, which continues to provide a solid, though boring, core. Longer-term, Natural Resources has exposure to areas like the Illinois Coal basin, which, according to the U.S. Energy Information Administration, is expected to see demand growth through 2040 in even a worst case scenario. And limited exposure to areas expected to see continued demand declines, like the Powder River basin. So, overall, Natural Resource Partners appears fairly well situated and has been doing reasonably well as coal prices have moved higher. Thus it posted the middle of the road gain of this trio. Which brings up the laggard for the month, Cloud Peak Energy. This miner's fortunes are tied to just one region (the Powder River), which is expected to see demand continue to decline over the next 20-plus years. Although it benefited from rising coal prices, as it highlighted when it reported earnings at the end of October, there are clear underlying problems, including continued red ink on the bottom line. One issue that's particularly noteworthy is international trade. Part of the Cloud Peak story has long been the opportunity of selling coal to the world, which seems more like a burden today. That's because Cloud Peak agreed to pay for terminal access in advanced, even if it didn't use it. Since it hasn't been exporting nearly as much coal as expected it is paying for port rights it hasn't been able to make use of. Add in the risk that president elect Donald Trump's tough words on global trade lead to a trade war, making exporting coal even more troublesome, and you can see why investors might be less than excited about Cloud Peak today. But then why did Westmoreland go up so much? First off, Westmoreland is far more leveraged than Cloud Peak. 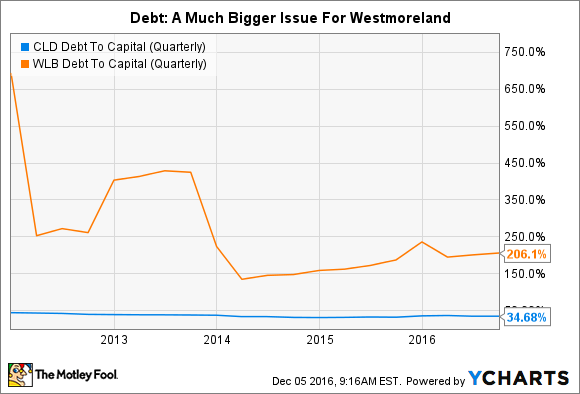 Long-term debt at Cloud Peak makes up about a third of the capital structure and over 100% at Westmoreland because it has negative retained earnings. While that's clearly not a good thing for Westmoreland, it means that an improving coal market has the potential to benefit the miner a lot more since higher revenues make paying its debts easier to do. Which was highlighted in the company's November 1st earnings release, where management noted record quarterly EBITDA. But here's the real difference, Westmoreland's business isn't focused on a coal region like Cloud Peak. Westmoreland focuses on owning mines located next to the power plants they feed (known as a mine-mouth mine). That means demand is far more certain for Westmoreland's coal. And with market expectations that Donald Trump will reverse some of the environmental rules put in place by theObama administration, Westmoreland would likely benefit more than Cloud Peak, which has to contend with international trade issues and is more exposed to the issue of still relatively low natural gas prices because it doesn't have customers reliant on its coal like Westmoreland. First and foremost, coal is an industry only suitable for aggressive investors willing to take a contrarian view of the world, a fact that remains true no matter who sits in the Oval Office. Second, Natural Resource Partners, Westmoreland, and Cloud Peak all have material headwinds they are dealing with, which makes them somewhat risky plays in an already risky industry. Most investors would be better off avoiding them all. That said, change is clearly afoot. If you want a diversified bet on coal Natural Resource Partners is worth a deep dive, particularly since it reaches beyond just the one sector. Westmoreland, meanwhile, provides a differentiated approach in the coal industry that's worth understanding even if you don't buy it. Cloud Peak, however, appears to have the least opportunity over the long term with a focus on a declining coal region and only one type of coal. That doesn't mean near-term performance can't pick up, but it does hint at a darker future overall.